Professional hunting and fishing guide, Jason Mitchell, set out to see what Missouri River Country had in store. 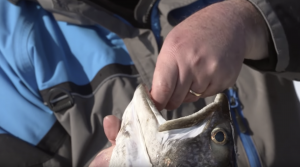 His search brought him all the way to Fort Peck Reservoir to target one of the hottest lake trout fisheries in the lower 48 states, and he was not disappointed. This monstrous lake spans for 134 miles and reaches depths of over 220 feet, leaving plenty of room for more than 50 species of fish. Check out Jason’s video for tips, tricks, and a piece of the action from his winter mission.